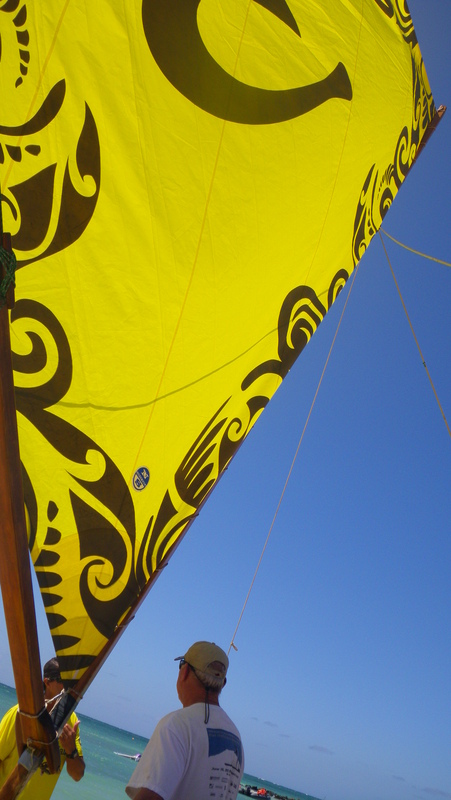 Sailing Canoes, Hawaiian Culture and a Jazzy Good Time! Look at that sailing canoe! Even sitting on the sand it looks fast and elegant. Except for the block on the main sheet the entire craft is made the traditional way with ropes, knots and wood. Ed and I had the chance to take a ride with part of the Team Olukai as part of the activities around the Olukai Ho’olaule’a event. 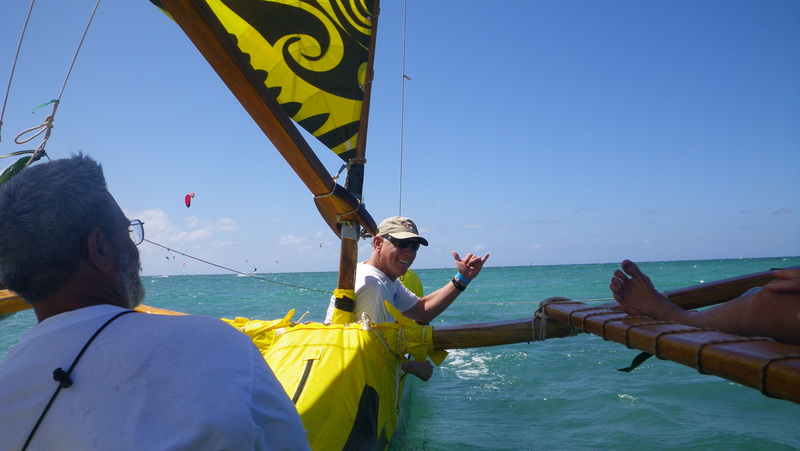 Since 1987, the Hawaiian Sailing Canoe Association has been leading the charge to ‘learn, revive, educate, and practice ancient Hawaiian skills as they relate to sailing canoes and the Hawaiian culture.’ As the team races various courses across the Hawaiian island chain, at each stop the team offers free canoe rides to locals and tourists, educating them on the cultural and historical importance of the craft. We hopped aboard with three of the team members and set off for exhilarating fun. Throughout the sail the team shared stories and information, tradition and obvious commitment to their sport. The winds and seas were probably quite mild compared to what they’d usually experience in a crossing, but we had the jazzy, sea-splashed pleasure of getting a taste of the experience. Inquiring about the ti leaves and wreaths on the canoe, we learned that it had recently been completely re-built. That day was its first launch since being blessed the evening before. The more we learned about the entire story the more engaging it became. For Ed and for me the experience riding along with the team was more than impressive. It provided a unique combination of harnessing wind, surf, paddles and camaraderie – all dear to us. 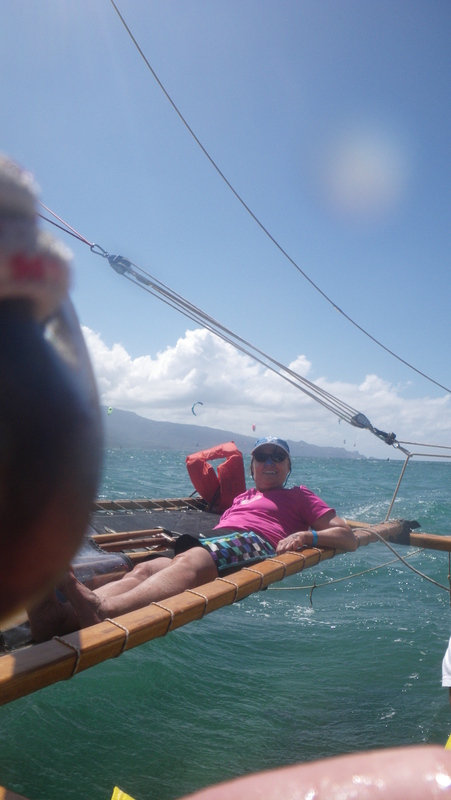 We can’t wait to return to Maui and the Olukai Ho’olaulea next year. 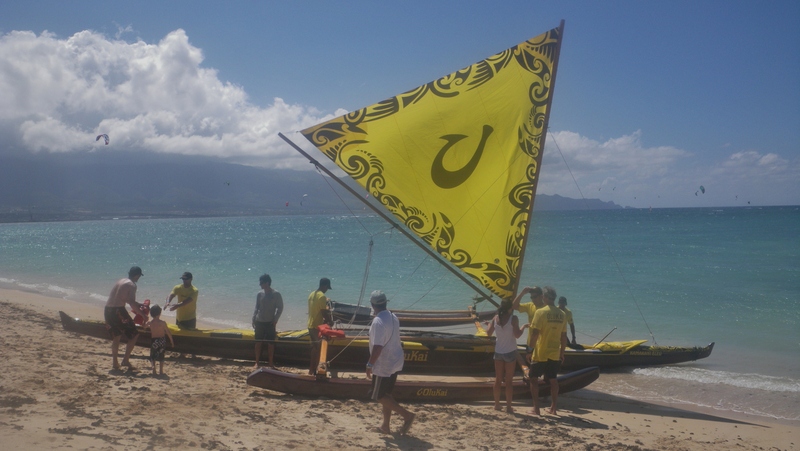 This entry was posted in Hawaii, SUP Racing and tagged Ho'olaule'a, OluKai by Water Words. Bookmark the permalink.